Saturday, November 8 at Raven’s Glenn Winery from 4-5pm. Tickets are $15. Wine/soft drink and appetizers are included. As part of the 3rd Annual Crow Homecoming, the Pomerene Center for the Arts presents Cleveland based Dancing Wheels. Buy your tickets. We’ll save them at the door. Why a Crow Homecoming? Coshocton is home to a winter roost of crows, meaning annually, upwards to 10,000 crows gather nightly from early November to early March in a line of trees along the river. Science says they’re here to stay. The Pomerene Center for the Arts says, “If you’re given lemons crows make lemonade, serve krownuts, hang crow quilts, hold a crow calling contest and dance! Why Dance? It is hard to watch the crows flying in to roost without thinking somehow it’s a dance–so many bodies moving together through space–in time with each other. Why Dancing Wheels? Dancing Wheels is one of the premier arts and disabilities organizations in the U.S. Christopher Reeve said, “Dancing Wheels is proof that the possibilities are endless.” In line with the spirit of the Crow Homecoming, the performance is meant to excite and inspire–changing (hopefully for a lifetime) our perceptions of the limits of individual disability and seeing (at least for the day) our winter roost of crows as the natural phenomenon that it is. Why Raven’s Glenn Winery? Raven’s Glenn is one of Ohio’s most picturesque wineries. The performance will take place in the banquet room overlooking the Tuscarawas River. With any luck some crows might serve as a backdrop as they fly along the river toward their nightly Coshocton roost. Tickets ($15/students $5) for the performance can be purchased online below, or at the Pomerene Center or Raven’s Glenn, or reserved by calling 740.622.0326. Earlier in the day on November 8 Dancing Wheels will offer a free dance workshop in the Salvation Army gymnasium from 11am-12:30pm. Space is limited so registration is required. The Pomerene Center is accepting applications from people with and without physical disabilities. click here for more information and registration. 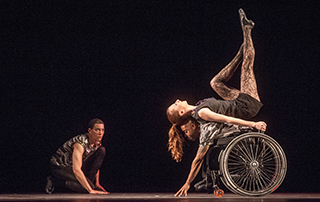 The Dancing Wheels Company, considered one of the premier arts and disabilities organizations in the U.S., is a professional, physically integrated dance company uniting the talents of dancers both with and without disabilities. Mary Verdi-Fletcher, the first professional wheelchair dancer in the U.S., founded the Dancing Wheels Company in Cleveland in 1980. Born with spina bifida, Mary wanted to offer others with disabilities full and equal access into the world of dance. An almost unimaginable concept at the time, Mary’s vision and passion have since helped to revolutionize our very notion of dance – as well as what defines a dancer. If dance is an expression of the human spirit, then it is best expressed by people of all abilities. Reaching the community through educational programs and performances is an important and fulfilling part of The Dancing Wheels Company’s mission and philosophy. With dancers representing diversity of age, ethnicity, gender and physical ability, the Company embodies the message of equality and accessibility. Coshocton has carried the nickname Crowtown for some time. No one seems to know exactly where the nickname came from but it is somehow linked to motorcycles. In 2008, when crows began to congregate for the winter in significant enough numbers to warrant propane cannons and pyrotechnics, the name began to fit like a glove. Coshocton. Crow resort town, Crowtown. Science says they’re here to stay. The Pomerene Center for the Arts says, “If you’re given lemons crows make lemonade hot crow-co, serve krownuts, hang crow quilts and dance. Come strut your stuff. Caw your caw. Click here to fill out your entry form. Want to practice before you come? click links below to listen and learn. 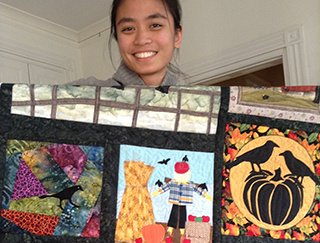 Buy a chance to win this quilt made by the Coshocton Canal Quilters. Buy your ticket/s below.